Sunrise in the San Juan Islands from Sucia Island. A flock of snow geese migrate over the passage between Sucia and Matia, against the misty backdrop of Mt. Baker. 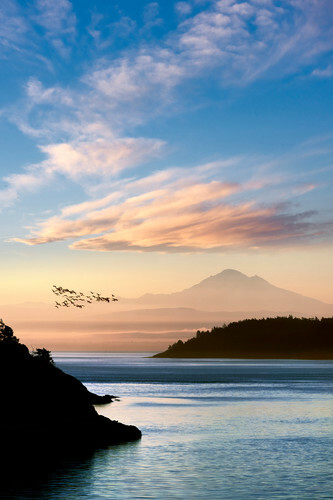 During the summer and early fall, in Northwest Washington, you may find my wife Bev and I, anchored on our boat in Fossil Bay on Sucia Island. A shoreside quest in the brightening darkness of early morning light had me hiking to EV Henry Point at the entrance to Fossil Bay. At this time I was shooting film with a Mamiya RZ 67. The pack and tripod where fairly heavy to lug on the pathway there, but I was rewarded with a beautiful moment that morning. I will always treasure this image. I hope you have the chance to treasure it also. Offered Limited Edition Sizes in inches. The measurement refers to the image area.